Some good news ... The new platforms 8 and 9 will open at London Bridge station on August 30th, which will allow us to travel to Waterloo East and Charing Cross again without having to use the Tube. Part of the new underground concourse will open beneath Southern Rail’s platforms. 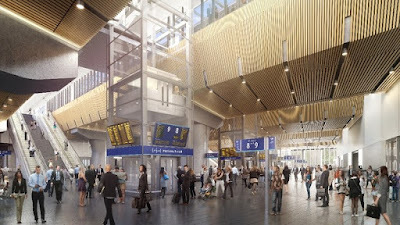 Passengers will be able to alight from their trains and then use the new escalators, stairs or lifts — which are currently boarded up on each platform — to reach the new concourse, which connects with the new platforms for Charing Cross. However, work will then start on rebuilding the Cannon Street platforms. This means there will be no interchange at London Bridge with Southeastern rail services to Cannon Street from late August until 2018. As with the Charing Cross services, National Rail tickets will be valid on London Underground to complete your journey. Once the work is completed, London Bridge should have all of its services restored (we will be keeping an eye out for the return of the 08:32 from Forest Hill), as well as a much-increased and improved Thameslink rail service, giving us more rail connections than before. Route 185 has been re-awarded to Go-Ahead London with new battery-hybrid buses. This new contract will begin in October, so we should start to see new quieter, less-polluting buses appearing on this route. 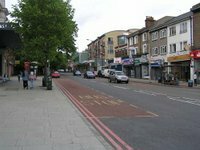 The peak-hour vehicle requirement on this busy route is going up from 24 to 25, which would suggest a slight increase in peak-hour buses, possibly to one every 7 minutes towards Victoria in the morning and towards Lewisham in the evening. The 363, which runs along Wood Vale and Sydenham Hill, is also going hybrid from October this year.